There was quite a rhubarb out in the garden this morning. No, it wasn’t a loud and boisterous argument that we had… it was a couple of huge rhubarb plants in need of harvest. The easiest (and healthiest for the plant) way to harvest rhubarb is to just grab a stalk near the bottom of the plant and give it a sideways pull. They come right off with a satisfying “snap”. Only the stalks (technically, a “petiole”) can be eaten. The leaves are poisonous so they make their contribution by going into the compost. 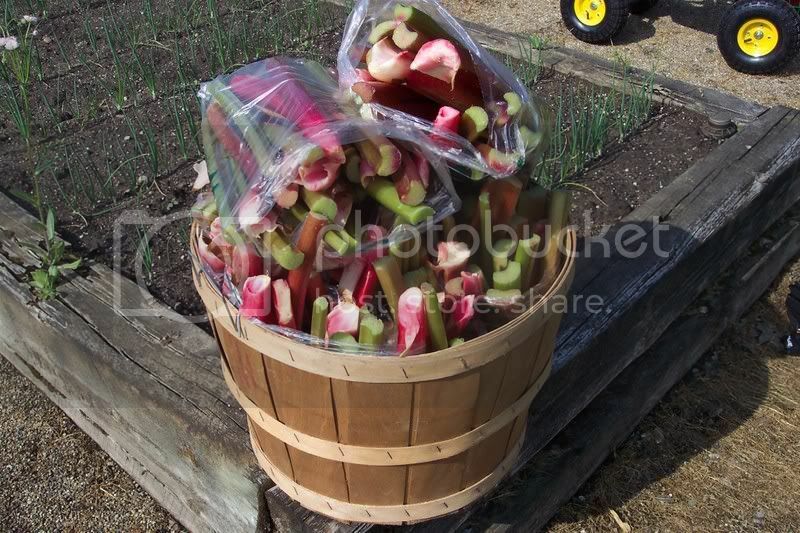 When I delivered this bushel of rhubarb, I took an informal poll asking how each person was going to prepare their share of the rhubarb. Rhubarb pie was the most common response, followed by rhubarb sauce, rhubarb wine was mentioned as a distant third. One lady mentioned that as a child in Germany, her mother would pick a tender stalk of rhubarb for her, dip it in sugar and serve it fresh as a sweet candy-like treat. I’m going to try that tomorrow, it sounds delicious…kind of sweet and sour and crunchy. This time of the year (during harvest time) rhubarb will send up seed stalks. If you want to keep your harvest going, break off those seed stalks as soon as you see them. 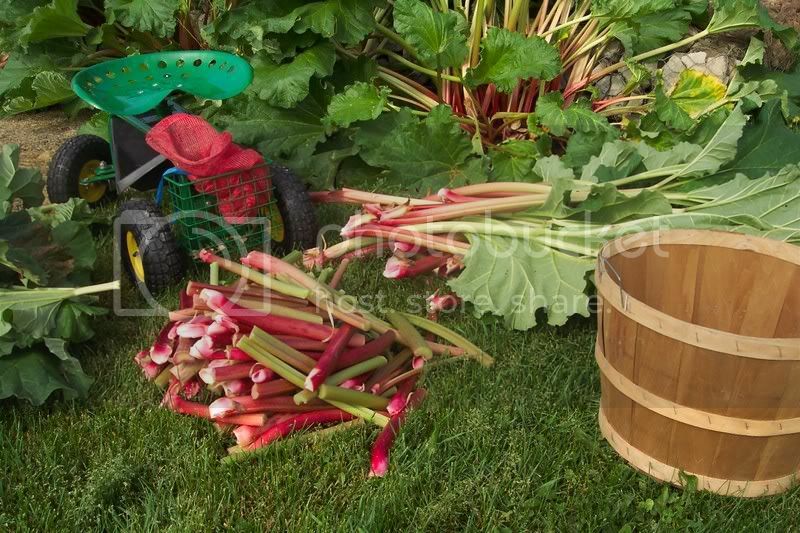 This way, you should be able to harvest stalks from a mature rhubarb plant (three years or older) for several weeks. Now, we have had the other kind of “rhubarb” in the garden from time to time but that’s a whole ‘nother story! Instead we went inside the portable plastic greenhouse where the temperature was over 110F (with all the doors open) and began dismantling it. Even with five of us, it took all afternoon in the blazing sun. This greenhouse measures 21′x21′ and is 14 feet tall at the ridge, so it is a fairly good sized structure. We did a lot of climbing up and down ladders to take down the roof. When you take it all apart you end up with a big pile of parts that all look the same but are different sizes. The last time we did this we used a “Sharpie” pen to mark the pieces, the so-called permanent ink barely lasted one season before being bleached out in the sun. This time I used a “paint pen” to label everything. This differs from a “Magic Marker” or “Sharpie” in that it uses a special thick ink formula so that the letters look like they have been painted on. The pen I used was an “Allflex Tag Pen”. These pens are used by livestock farmers to mark numbers on their animal’s ear tags. Those tags need to be able to hold up under some pretty severe conditions. Five years ago I labled some metal plant markers with this pen and they still look almost like new. Next year the greenhouse should be easy to piece back together…that is, if I can remember what all those cryptic markings mean! I’ve tried for years to grow Lupine from seed and have never had any success. 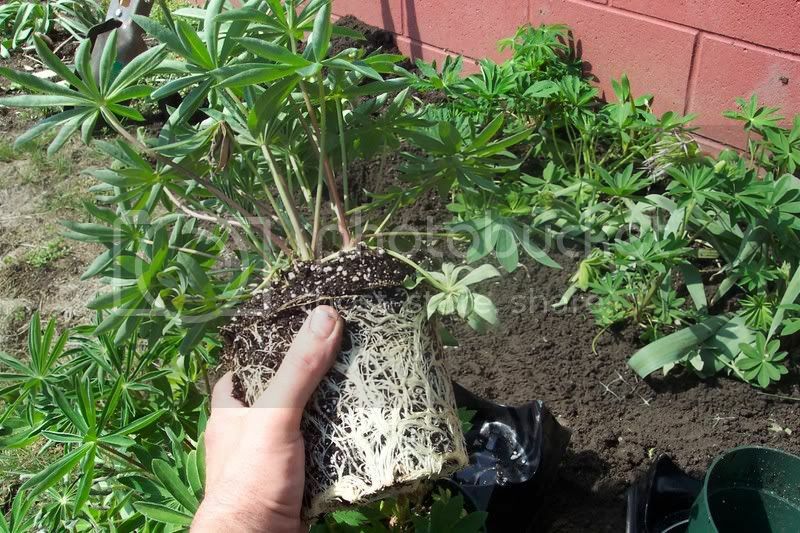 This year I cheated and bought 50 Russell Lupine roots from the nursery. Of course this is not really cheating, I only say that because I enjoy the challenge of propagating my own plants. Not everyone has access to the kind of facilities I have… so that’s why there are nurseries and garden centers. 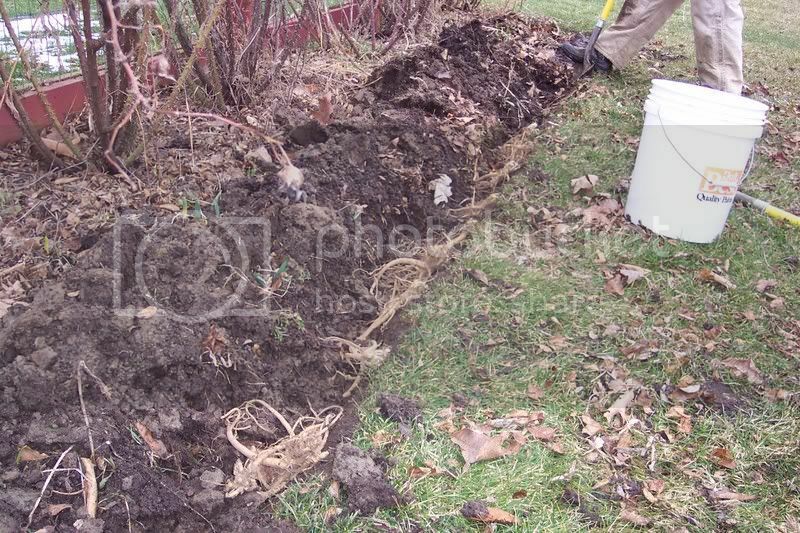 We simply dug a trench and were careful to spread out the roots before we covered them up. Meanwhile, I took the remaining roots and planted them into 6′ plastic pots and placed them into our semi-heated portable greenhouse. I just let them “simmer” in there, keeping them watered of course, until the end of April. I planted them as I would any other potted plant. 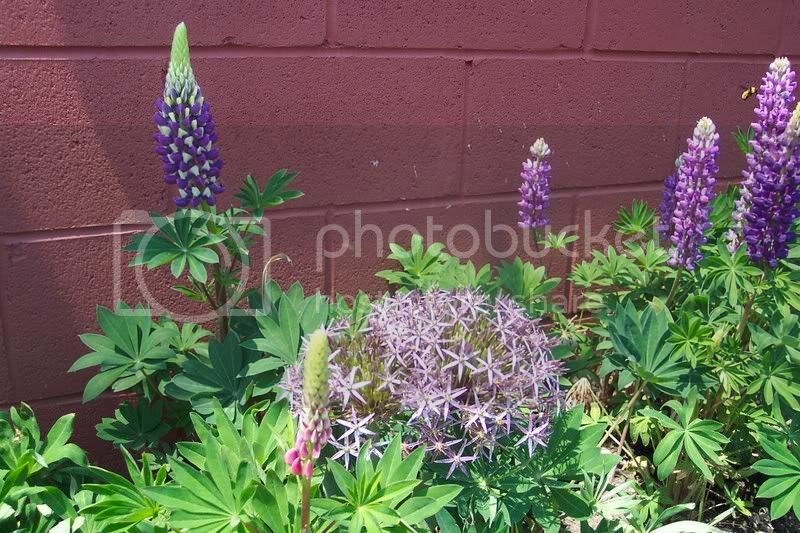 The lupine are the tall skinny flowers, the ball of star-like flowers is an Allium. This was a mixed batch of Lupine. There are different shades of pinks and blues in this bed. After all these years of wanting Lupine I finally got them…and it was so easy! A fine article appeared in the May 21,2007 issue of Newsweek entitled “Saving Your Seed Money”. Author Linda Stern crammed in a bunch of money saving gardening tips into a one page article, such as: starting out with smaller plants; and, dividing and trading perennials. She also sites information provided by the National Gardening Association: American gardeners spent $34 billion on their yards last year. That’s an average of $401 per family. I’ll bet you are one of the 3 out of four Americans who like to garden! Remember back in April when I talked about the two potted fig trees in the greenhouse? Well, here is most of the harvest from those trees. I say most because I ate a few fresh off the tree. This first harvest is called the “breba crop”. 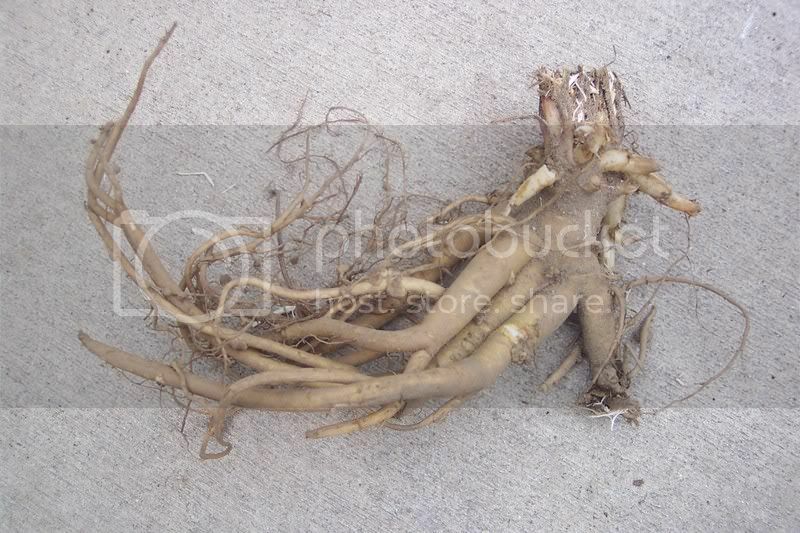 It is produced on old stems grown by the trees last year. The variety is “Kadota” and is rated “fair” for eating fresh. It is rated “excellent” for drying. 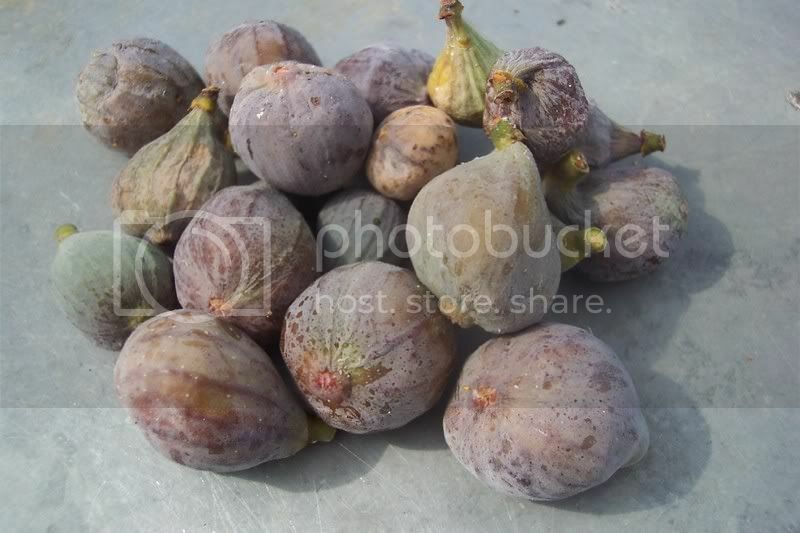 I’m lucky to have gotten any figs this time of year because Kadota rarely produces a breba crop. I put the pile you see here into the dehydrator and dried them. They are now in a “Zip-Loc” bag on my desk. I have not tried them yet. These trees will produce fruit again later on in the fall. Those fruits are known as the “main crop” and are produced on the new summer growth. Before you even ask I’ll have to say; no, there is not here enough to make a batch of home-made “fig newtons”. Watch out this fall though, I’m planning on a bumper main crop!